“Voopa, voopa” is a bit more descriptive of the sound that I wish I was making with my hand saw and this monstrous pile of “bruta” lumber. Unfortunately, my hand saw is of the toolbox variety, so “voop” is about the best I can manage. Those of you who know from experience what a toolbox saw is can appreciate the implication immediately. It may help if the rest of you can picture me standing proudly displaying this 24″ hand saw in front of my chest. Sort of like Che Guevara with an AK-47, only smaller. Don’t forget to picture the imposing stack of over-sized 2 x 4s in the background. A Skil-saw, of course, is the circular saw that is the reason that carpenters and people in the masonry restoration business in Seattle can’t hear worth a damn, so there are trade-offs and I hear just fine. Now off to work, even if I do feel a bit like one of Snow White’s dwarfs with my little saw. Actually, it’s a pretty good saw. And the sun is shining. And if I stopped right now Chad and Heather could still make their way across the new deck and reach the WC. The carpenter, by the way, did us a favor by presenting such a hefty estimate. I say that he did us a favor because Denise and I actually enjoy working together. And we’re pretty good at it too. Sun’s still shining and the herd of horses has moved to their own workplace down the road beside Quinengo’s farm below our little “loma” and time is passing. This is a part of the walkway replaced with the rough-sawn “bruta” pressure-treated lumber. 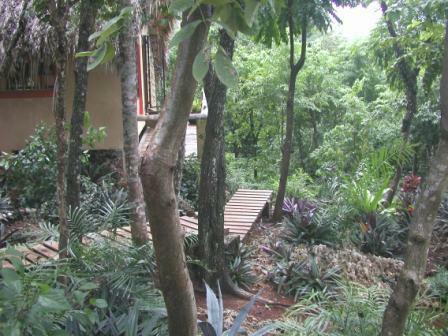 In the background you can see the deck that serves as the front porch of the guest bungalow. It also pulls double-duty as the hallway between the living room and bathroom of the bungalow. We got our money’s worth out of the old walkways. About .98 cents worth. …and beginning to frame the new porch.